Meatball curry also called as Muthia ki Tarkari in our home is one of those recipes that are handed down from one generation to another. I learnt it from my very talented sister in law. This mutton kofta curry recipe is a delightfully easy dish to make, and an incredibly tasty dish to serve. While meatballs made of mutton mince are popular in Indian Subcontinent, you can make them from chicken mince or beef mince. And if you prefer vegetarian food, feel free to make minced Vegetable koftas and use the curry recipe to douse them. To make melt in mouth koftas, use a mixer or a hand blender to make the store bought mince meat finer. Kofta is a meatball or meatloaf and is a part of, Afghan, Azerbaijani, Arab, Armenian, Balkan, Bangladeshi, Indian, Palestinian, Iranian, Jordanian, Kurdish, Pakistani, Romanian, Lebanese, and Turkish cuisine. In the simplest form, koftas consist of balls of minced or ground meat—usually beef, pork or lamb—mixed with spices and/or onions. In Bangladesh, Pakistan, Turkey and Iran, koftas are usually made of lamb, beef, mutton or chicken, whereas Greek and Cypriot varieties are usually made of pork, beef, veal or mixtures of them. In India, vegetarian varieties include koftas made of potato, calabash, paneer or banana. Koftas in India are normally cooked in a spicy curry/gravy and are served with boiled rice and a variety of Indian breads. 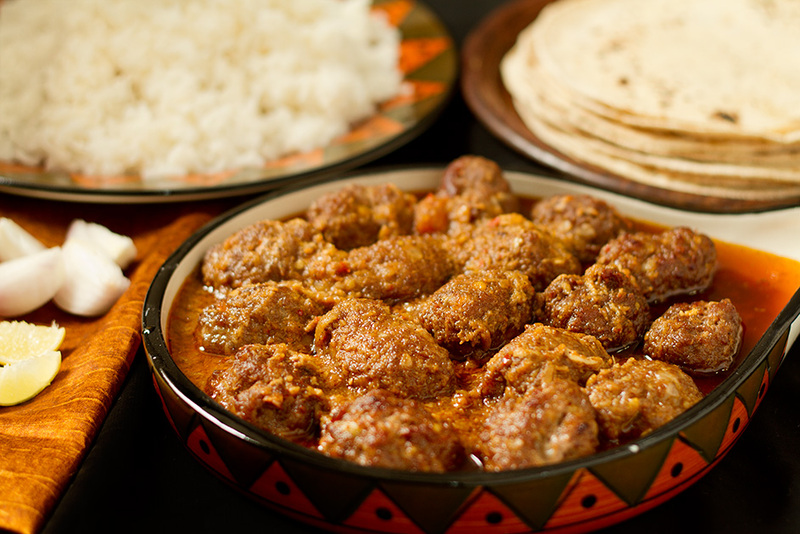 In Iran, Iraq and Azerbaijan, koftas are served with a spiced gravy, as dry versions are considered to be kebabs. Shrimp and fish koftas are found in South India and West Bengal, in some parts of the Persian Gulf states, and parts of Egypt. Make a paste of split Bengal gram dal. Roast the cumin seeds and coriander seeds separately till each of them turn completely black and allow them to come to room temperature. Combine the two and make a fine powder. This is Kala Masala. It can be stored for up to 6 months in an air tight container and is used in meat curries (mutton, beef or chicken) for flavoring and giving the curries a dark colour. You only need a couple of pinches of kala masala for this recipe. In a large bowl, mix minced meat, half of chopped onions, finely chopped green chilies , half of Cumin powder, half of ginger and half of garlic , dal paste and a bit of salt . Shape koftas (or muthias) by pressing the mince mixture between your fingers and fry them in oil till they are well browned and get completely cooked. In a deep bottomed pan, heat oil and fry onions, garlic and ginger. After the onions turn pink, add the coriander powder, 1 Tbsp Cumin powder, Red Chilie powder and garam masala. Reduce the flame and fry till the masalas release oil. Use a Tbsp of water to fry the masalas well. Add the tomato puree and continue frying till all the water is absorbed and masala is thick. At this stage, the oil should separate from the masala again. Add 2 Cups of warm water, allow the curry to a boil for 5 minutes, add the kofta and boil for another few minutes. Sprinkle 2 pinchs of kala masala on the curry, and switch off the gas. Keep the curry covered for about 10 minutes so that the koftas soak the curry and the flavour of kala masala sets in. Serve the Meatball curry with Roti, Nan, or steamed rice. Lovely indian food dishes. Will be happy to get recipe fir yr lovely and healthy dishes. There is a lot of cummin and coriander added, is that okay? Dish looks tantalizing, but would it be smothered with spices? Hi, Thanks for stopping by on my site. You need 2 Tbsp of Cumin and Coriander to make burnt coriander-cumin powder (kala masala) but only 2 pinches of this powder is required to be used to finish and flavour the recipe. Do try it, and let me know how you like it.